I was never a fan of Tabbouleh when I was growing up. My Dad always tried to convince me to eat it whenever he bought us kebabs but I was having none of it. Just plain iceberg lettuce for this little duck, thank you very much! And you can keep that strange hummus stuff, too! Thankfully, things change. Now that I’m a daredevil hummus-and-herbal-tea-loving vegan, I decided to live a little and give it another try. I steered clear of the dreaded curly-leaf parsley used to garnish every plate until the 1990s and opted instead for flat-leaf, continental parsley. I also switched bulgur wheat to healthier and gluten-free quinoa. And the verdict? Oh my WOW, why did I wait so long? So simple, refreshing and delicious, I made it on Tuesday and haven’t stopped eating (and talking about) it all week! Enjoy it as a Mezze Platter dinner with toasted pita bread triangles, or pack it up in a lunchbox. I did both! 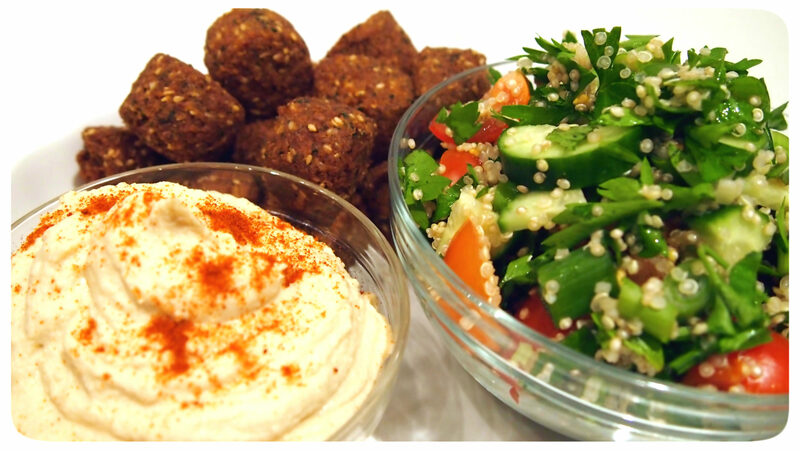 Together with fresh hummus and falafel, it makes an amazingly simple and tasty meal. Don’t you hate it when Dads are right? Combine all ingredients in a food processor or high-speed blender and blend until smooth and creamy. Transfer to a bowl, sprinkle with ground paprika or dukkah (optional) and serve. I love very bite & everydish in this lovely mezze platter! I love quinoa tabbouleh but my hubby doesn’t! So, I will eat this mezze platter when he is out! MMM! What a lovely meal indeed! I actually much prefer flat leaf parsley too, even though my Dad grew curly leaf parsley commercially for years 🙂 Home made hummus is always better than shop bought too, isn’t it? Yummo! Oooh, great minds think alike! 🙂 It’s incredible! Dads are totally right 😉 I make a quinoa tabbouleh on my site too, but my quinoa ratio is much higher! I love yours with more green Yummy stuff Bex! Yummy! I want to make some of that right now! Just found you through VBU. This looks amazing, and it seems as though we have similar tastes. I just made quinoa tabbouleh not long ago! Growing up I hated mushrooms, now I’m obsessed with them. Funny how things change, isn’t it? Welcome, Ilena. 🙂 And yes, it is SO funny, isn’t it? I never liked tea before either and now I get grumpy if I don’t have at least two herbal cups per day.